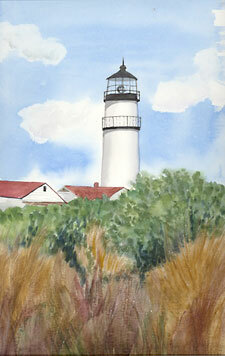 EDITOR'S NOTE: Jane May Jones's exhibit entitled "New England Through the Eyes of an Artist" is featured in The Gallery at The Garden throughout January 2015. 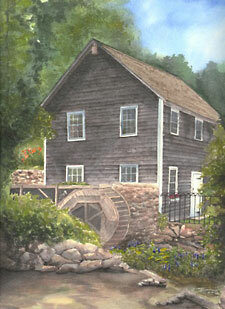 Located at 157 Main St. in Brattleboro, The River Garden is home to the Strolling of the Heifers organization. 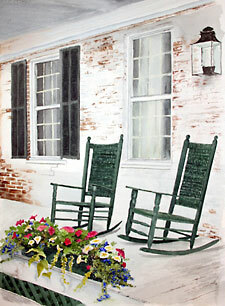 Open to the public as a regional information center and gallery, its hours are Mon.-Fri. 9-5, Sat. 10-5 (the Winter Farmer's Market runs 10-2 each Saturday), and Sun. 1:30-3:30, in addition to first-Friday Gallery Walks till 8:30 p.m.
Jane May Jones first moved to the U.S. from England with her family when she was six years old. "We lived in Massachusetts for six years before returning to England, where I completed high school and excelled in Art." Although she wanted to pursue her art education, Jane spent two years in secretarial school -- a more practical option -- and took a job in a local company until moving to France when she was nearly 22. "I worked for the most part at IBM, except for a few other part-time jobs." While based in France, she traveled the world, visiting every continent but South America, which still remains on her "bucket list." During these journeys, she visited some of the world's most famous art galleries and became first-and-foremost a fan of the Impressionists. "In 1986, I visited Vermont and fell in love with the glorious views and the Fall colors. Shortly thereafter, I returned for a longer stay. Just a few days after my arrival, I met Don Jones, and ten months later we were married. "Although all aspects of art have been a major part of my life," says Jane, "when I was introduced to the methods of watercolor painting, I knew I had found my medium." Her paintings have been shown at fine art exhibitions and galleries up and down the East Coast, and her studio and gallery are featured each May during the Vermont Crafts Council's Open Studio Weekend. 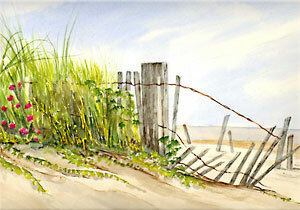 Otherwise, Jane's gallery is open by appointment, and her work is also available through her online Etsy shop. Jane sums up her experience in this way: "I see myself as an artist, entrepreneur, and educator, and enjoy helping and teaching others the skills I have learned so far in my lifetime. I am forever learning and dreaming!" 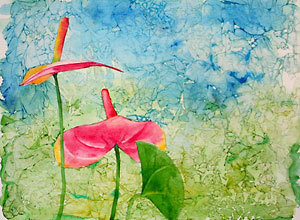 "Anthurium" from Jane's new Magical series: "These new watercolors were created recently on an artist retreat. I developed them using tissue paper to create the background. The effect I believe is magical!" The paintings mostly begin with her originally composed photography: "In my daily travels as well as when I travel farther from my home in Vermont, my cameras are often my side. The scenes I capture not only show the natural beauty of the composition, but often a feeling of peace and serenity. 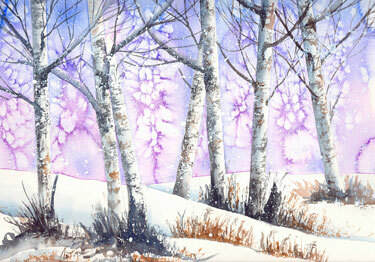 I then transpose the scene and feeling into my watercolor painting." A combination of architectural and garden elements is often brought to the forefront in Jane's work. The muted grays and browns of older houses she is drawn to are "livened up with a punch of color in a flower box or rambling rose." Jane's interest in gardening began when she was a small girl in England and has been a passion most of her adult life. Another joy has been decorating their home. She has used both her gardening and interior decoration skills professionally. "These two talents are married together in my paintings and are the reason for most of the subject matter in my watercolors. "My work focuses on interesting doorways and other architectural elements of homes and businesses, as well as the scenic beauty of Vermont and other areas of New England. Nearly all of the paintings also include some kind of flora and even some fauna, thus combining my loves of design and beauty in nature. 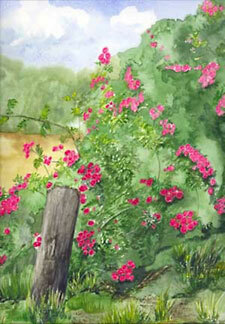 Some of my paintings also depict scenes from the tropics." In fact, after more than 27 years together, Jane and Don are getting ready to spend some of the harsh Vermont winter months in a warmer climate.